Did People Go to Heaven Before Jesus’ Death & Resurrection? Is this saying that people didn’t go to Heaven before Jesus’ death and resurrection? Where had everyone who died gone before Jesus died and rose? Did this change after his death and resurrection? What verses can you share with me about this? Is this saying that God is present in Hell? No. It’s saying He is present in Sheol. It would seem (I’ll give Scriptural justification for this below) that Sheol was divided into two sections: Abraham’s Bosom and Hades. Abraham’s Bosom was a place of comfort for those who died in faith. Since they had not yet been redeemed through the death and resurrection of Jesus, they could not go to Heaven, so this was a sort of holding place, or waiting room for the souls of the Old Testament believers who died in faith, trusting not in their own works or performance to garner them favor before God, but casting themselves on God’s mercy and grace to save them through the Messiah who was to come. Hades, on the other hand, was a place of torment for those who died apart from awareness of their shortcomings and apart from faith and trust in God’s mercy and grace. Hades, like Abraham’s Bosom, was/is a holding place or waiting room for the souls of those who have died apart from faith, and though those in Hades suffer torment presently, one day Hades will be emptied into the Lake of Fire, meaning that Hades is not the final destination for those who have died apart from faith. Did this change after Jesus’ death and resurrection? It seems that in the time between Jesus’ death and resurrection, Jesus descended into Sheol and released those from Abraham’s Bosom and led them to Heaven. Those who die now in faith in Jesus go to Heaven, i.e. the presence of God. Hades, on the other hand, remains in tact, and those who die apart from faith still go there. Luke 16:19-31 gives us insight to this through the story of the rich man and Lazarus: Lazarus, a poor man who died in faith, is taken to Abraham’s bosom, whereas the rich man who died apart from faith is taken to Hades. Between the two parts of Sheol, the story tells us, is an uncrossable chasm, and there is no escape. The rich man desperately wants someone to go and speak to his family members, and plead with them lest they end up in Hades as well, but the man is told that his family members have been given Moses and the Prophets (i.e. the Scriptures), and they should listen to them. The latter of these was not evangelism, but a pronouncement of judgment upon those spirits in Hades. We know this because of the qualifying text in 1 Peter 3:20. 2 Corinthians 5:8, Luke 23:43 & Philippians 1:23 tell us that when a believer dies today, they are taken to the direct presence of God, AKA “paradise”. Revelation 20:11-15 describes how, after the judgement of the living and the dead at the end of all things, Hades will be cast into the Lake of Fire. Jesus said in Matthew 24:35 that Heaven and Earth will pass away, but his words never will. 2 Peter 3:7 says, But by the same word the heavens and earth that now exist are stored up for fire, being kept until the day of judgment and destruction of the ungodly. And 2 Peter 3:10 says, But the day of the Lord will come like a thief, and then the heavens will pass away with a roar, and the heavenly bodies will be burned up and dissolved, and the earth and the works that are done on it will be exposed. Thus, after the final judgment, there will be a new heavens and a new Earth, which will be not only the restoration of Eden, but the fulfillment of what Eden would have been had sin not entered in. In the New Jerusalem, once again, we see humankind together with God, with no sin nor shame, nor any of the destructive effects of sin (i.e. sickness, pain), and that the Tree of Life is there. Whereas Eden was a garden, the New Jerusalem will be a garden city. Thanks for these great questions! Keep studying the Word, and feel free to send more questions to me by filling out this form. If Jesus is God, Why is He Called the “Son of God” and “the Firstborn Over All Creation”? Why is Jesus Called the Son of God? The long and short of it is that “Son of God” is a Messianic title, which means that Jesus is the long-awaited, promised king of Israel whom God had promised to send to save the people and set them free in an eternal and ultimate way. The most important text for understanding this is Psalm 2, which is a “coronation psalm,” meaning it would be read at the coronation of a king. It includes this line: I will tell of the decree: The Lord said to me, “You are my Son; today I have begotten you. (Psalm 2:7) This line is quoted and applied to Jesus in Acts 13:33 and Hebrews 1:5 & 5:5. Most important is to understand the context of this phrase “Son of God” in reference to the king. In the Ancient Near East (ANE) kings were considered to have a special relationship with God. In many cases, like in Ancient Mesopotamia and Egypt, the king was considered to be deity themselves. Such an idea would be an abomination to the Jews and in complete contradiction to everything their Scriptures said about God. However, they too believed, as we see in Psalm 2 and other “royal psalms” that the king had a special relationship with God. Thus, the term “son of God” spoke of the king’s special relationship with God, but throughout the Old Testament there is the hope of a true and better king, the one who will establish the throne of David forever and rule over an everlasting kingdom which will have no end (see: the Davidic Covenant in 2 Samuel 7). Then though there were many kings of Israel, none of them were the ideal, TRUE KING that God had promised and Israel waited for. To call Jesus THE Son of God is a reference to him being THE king whom God promised to send to set the people free and save them ultimately and eternally, i.e. : the Messiah. For more on the meaning of the term “Son of God” check out: What Does it Mean that Jesus is the Son of God?, or the related topic: If Jesus is the Son of God, Why Did He Call Himself “the Son of Man”? Why is Jesus called “the firstborn over all creation”? Does Colossians 1:15 imply that Jesus was the first creature whom the uncreated God created? If Jesus is the uncreated God, then why is a term like “firstborn” used of him – I mean, it actually contains the word “born” in it, which implies coming-into-being, does it not? The word firstborn (prototokos) is also applied to Jesus in Colossians 1:18, Romans 8:29, Hebrews 1:6, and Revelation 1:5. In each and every case, when this word is used of Jesus, it refers to supremacy in rank. All ancient culture had a practice called “primogeniture” – which meant that the firstborn son got all the wealth of the father and he got all the father’s status and power. From a legal standpoint, a firstborn son was equal with the father. So when this title is used of Jesus, it in no way means that Jesus is less than God, or that he was created by God, rather it refers to supremacy of rank. To say that Jesus is the firstborn of all creation means that he holds the position of primacy over all of creation, i.e. : no one and nothing holds a candle to him; he has all the status and power of the Father and is equal to the Father, although still distinct from the Father. Interestingly, John Lightfoot cites Jewish rabbis who sometimes referred to God as “the firstborn of the world,” meaning that God was supreme over all of the world — that there is none higher than him. How do we know this interpretation of Colossians 1:15 is the correct one? By looking at the verses which immediately follow, which declare Jesus to be the uncreated creator. Colossians 1:16-17 say: For by him (Jesus) all things were created, in heaven and on earth, visible and invisible, whether thrones or dominions or rulers or authorities—all things were created through him and for him. And he is before all things, and in him all things hold together. The Bible begins by telling us that God created all things, and here it tells us that Jesus created all things. The clear message is that Jesus is God in the same way that the Father is God. He is beginning-less creator, equal to the Father in substance, status and power, and yet distinct from the Father. Thus, rather than undercutting trinitarian theology, Colossians 1:15-17 undergirds the foundation of trinitarian belief. Did you know that the Book of Esther never mentions God? Did you know that whereas almost every Old Testament book is quoted in the New Testament, the Book of Esther is not? The Book of Esther tells the story of a Jewish girl in Persia who becomes a queen and uses her position to save the Jewish people from an attempted genocide. This story is the basis for the Jewish holiday of Purim, a holiday which is not prescribed in the Law of Moses. These facts, along with the lack of corresponding historical records which corroborate the events talked about in the book have led many people to question not only whether Esther is historical, but whether it belongs in the Bible at all. Martin Luther, for example, criticized the Book of Esther, accusing it of being too aggressively nationalistic and containing no gospel content. It isn’t only Christians who are divided over the Book of Esther; Jewish congregations are also divided over whether Esther is a true story or a fable, and whether it belongs in the canon of Scripture (e.g. the Orthodox Union considers it historical and canonical, whereas the Assembly of True Israel considers it neither historical nor canonical). The Book of Esther focuses on a ten year period (483-473 B.C.) in the Persian Empire during the reign of Ahasuerus, also known as Xerxes. The book contains several historical, chronological and cultural details, which would lead us to believe that it is intended to be read as actual history, rather than as a parable. As in the case of Jonah (see: Is Jonah a Historical Account or an Allegory? ), specific historical and geographical details are characteristic of historical narratives and not of allegorical stories (e.g. the Good Samaritan or the Prodigal Son). In Esther 1:1 we read an accurate description of the extent of Xerxes’ empire, in 1:2 we read about the location of the seat of the Persian government, and in 1:3-4, we read that in the third year of his reign, Xerxes gave a banquet for all his officials and servants, including the army of Persia and Media. The reason this is important is that it coincides with the accounts of the historian Herodotus which tell us that Xerxes’ second invasion of Greece took place from 480 to 479 B.C., which means that this great gathering mentioned in Esther 1:3-4, which verse 4 says lasted 180 days, is likely describing the preparation for that military invasion of Greece. According to Herodotus, Xerxes began his return to Persia after his defeat by the Greek navy at Salamis at the end of 480 B.C. The dismissal of Queen Vashti, described in Esther chapter 1, would correspond to this timeline, having happened just before Xerxes departure to Greece, and his encounter with Esther would have happened just after his return. Herodotus claims that Xerxes “sought consolation in his harem after his defeat at Salamis,” which corresponds with what the Book of Esther describes and the time when Esther would have become queen. Despite the clear historical setting, no outside sources exist which tell us about Esther becoming queen or about the killing of 75,000 Persians. However, it seems that the author’s intent is to relay historical events, and while corroborating sources do not exist, the same is also true of other historical accounts, including those of Herodotus. Thus, there doesn’t seem to be any evidence which would lead us to believe that Esther is not a historical account, and where historical accounts from this period do exist, they line up with the historical, cultural and geographical details that Esther gives. Why is Esther in the Bible if it doesn’t mention God? Esther was recognized as scripture by the Jews before the time of Christ. Josephus, the Jewish historian, says that the Jewish Scriptures were written from the time of Moses “until Artaxerxes,” whom Josephus identifies as the “Ahasuerus” in the book of Esther (Against Apion 1.40-41 & Jewish Antiquities 11.184). Therefore, Josephus understood Esther to be the last book to be written in the Jewish canon. In the Christian church, Esther was listed among the books of the Old Testament canon at the Council of Carthage in A.D. 397, but was widely accepted by Christians as canonical long before that because of its inclusion in the Jewish Old Testament canon. Although God is not named in the book, God is not absent from the story. Like in the story of Joseph, Esther is a story which highlights the providence, or the “invisible hand of God” at work in the world, ordering and ordaining events to happen according to His divine plan. Many scholars believe that the absence of the word “God” from Esther was not a mistake, but was an intentional literary device, aimed at focusing attention on the importance of human initiative and divine providence. The sheer number of “coincidences” in the Book of Esther beg the reader to take notice of the invisible hand of God at work to bring about salvation and justice. Does Esther contain any gospel content? There is an enemy of the people who wants to kill and destroy them. God raises up a savior at just the right time, who uniquely has access to the throne of the great king, who alone can save the people from this impending doom. This savior, at risk to herself, enters into the throne-room of the king and intercedes on behalf of her people, thus securing their salvation. The evil-doers, who throughout the story seemed to act unencumbered, receive the pronouncement of judgment from the king. Furthermore, we see how the evil Haman desired to be treated as royalty even though he was not. In this we have a contrast with the one who was indeed royalty, but set aside his privileges in order to become a servant so that He might save us (see Philippians 2:3-11 and Matthew 20:28). Finally, we see in Esther an example of God’s faithfulness to His covenant people. Because of the scarcity of historical accounts and the lack of thoroughness of those which exist, it would be unwise for us to assume that this story is not historical just because we have not yet found other accounts which corroborate certain aspects of this story. The fact that some parts of the story do have corroborating historical evidence and accounts should give us confidence that Esther is a historical story about actual events – which ultimately are part of the picture and foreshadowing of the Great Savior who has now come: Jesus Christ, who entered into the throne room of God to make intercession for us, that through Him we might be saved from the great enemies of our souls. If Jesus is the Son of God, Why Did He Call Himself the “Son of Man”? Jesus’ favorite way of referring to himself was as the “Son of Man”. This term is used of Jesus 88 times in the New Testament, and Jesus refers to himself as the “Son of Man” more often than as the “Son of God”. his dominion is an everlasting dominion, which shall not pass away, and his kingdom one that shall not be destroyed. This description of the “Son of Man” matches that descriptions of the Messiah found elsewhere in the Old Testament. What is particularly interesting is that the Son of Man is exalted, divine, and is sent from Heaven – and yet, is distinct from “the Ancient of Days”. This is in line with Trinitarian theology, which states that the Son and the Father are distinct persons within the Godhead. The Son of Man according to this prophecy is both human and exalted. He does the work which only God can do, indicating that he is God, and yet he is distinct from the “Ancient of Days” who sends him. This tells us that the Messiah would be human, but he would also be God at the same time, while a distinct person from the “Ancient of Days”, AKA the Father. As I discussed in a previous post – Why Did Jesus Tell Some People to Keep Quiet About His Miracles and Identity? – although Jesus was sometimes very explicit about his identity, other times Jesus was more subtle and implicit in how he revealed his identity. In that post I delve into some reasons why that was, but here it suffices to say that by using the term “Son of Man”, Jesus was using a term by which those who had ears to hear would pick up what he was putting down. The term Son of Man emphasizes the fact that Jesus was truly and fully human. Although he was conceived of the Holy Spirit and born of a virgin, he is nevertheless fully human. Remember that the Gospels were written by humans under the inspiration of the Holy Spirit. What that means is that there is a particular telos or objective inherent to what they have written and how they have written it. This is true of any historical account: any time anyone tells a story, they include certain details and leave out other details depending on what they want to emphasize for their audience. This is true of the Gospels as well. So what is the telos or objective of the Gospel writers in making sure we know that Jesus often used the title “Son of Man” in referring to himself (other than the fact that he actually did)? Probably it is to emphasize that Jesus was truly and fully human. We know from early church history, that there was a tendency amongst some Christians to emphasize the deity of Christ to the negation of His humanity. The converse was also true, and these discussions and debates culminated with the codifying of the doctrine of the Trinity at Nicaea and in the Athanasian Creed. Even to this day, there are some Christians, e.g. Coptic Christians, who are “monophysites”, which means that they believe that Jesus only had one nature: a divine one, and that he was not fully human. The use of the term “Son of Man” emphasized Jesus’ true humanity. The same could be said of “Son of Man” for that matter, in the sense that all humans are sons or daughters of men. The difference is that in the Jewish context, the term “Son of Man” actually carried more significance because of Daniel’s prophecy. Remember that Jesus actually did call himself the Son of God on several occasions, as John’s gospel in particular records. Again, this gets to the point of the telos of John’s gospel, which is to emphasize Jesus’ deity – whereas other gospels aim to emphasize his humanity. But it is not only in John’s gospel that we see Jesus being called “Son of God”, which reminds us of the importance of his two-fold nature as both fully God and fully man, a nature that was necessary in order for him to be the perfect Savior that we need. This was understood by the Jewish people to be a claim of deity, which is why they accused him of blasphemy and condemned him to death. Why do the Dead Sea Scrolls Matter? “The older the copies, the closer we get chronologically to the autographs, the fewer copies there are between the original Old Testament writings and these copies that we have,” explains Ryan Stokes of Southwestern Seminary. The Dead Sea Scrolls are hundreds of years older than the previously known oldest manuscripts, and they prove that the Old Testament text had been faithfully preserved over the centuries, and that the Hebrew text translated for modern Christians accurately represents the Bible that Jesus read and the Bible as it was originally written. In at least one instance, the Dead Sea Scrolls helped to solve a mystery which has great theological significance regarding Jesus. Psalm 22:16 says: a company of evildoers encircles me; they have pierced my hands and feet. Christians have always considered Psalm 22 and this verse in particular to be a prophecy about Jesus’ crucifixion, which is all the more incredible since it written hundreds of years before crucifixion had even been invented. Before the discovery of the Dead Sea Scrolls, the historical veracity of the New Testament was often called into question. From the expectation of the Jews regarding the Messiah, to the world of Pharisees and preachers like John the Baptist, many claimed that the world the New Testament described was purely fictional. However, with the discovery of the DSS, it could be confirmed that the New Testament very accurately described the culture and history of first-century Israel. Of the nearly 1000 scrolls which have been found, around 700 of them are non-biblical writings. These non-biblical writings include things like community rules and expectations regarding the Messiah. It is from this that we learn that certain Jewish communities practiced baptism for repentance (ala John the Baptist), and that they were expecting two Messiahs: one who would be an priest and the other who would be a king. Jesus ultimately did fulfill this biblical expectation, albeit not in the exact way they expected. Of the 240 biblical scrolls from Qumran, 235 are written in Hebrew and 5 are in Greek. Of the 701 non-biblical scrolls, 548 are written in Hebrew, 137 in Aramaic, and 5 in Greek. This shows that Jews at the time of Jesus did indeed speak Greek, Hebrew and Aramaic, the three languages of the Bible. Scholars believe that many of the scrolls were originally taken from Jerusalem, when a group of priests who believed that the temple worship and leadership had become corrupt, left Jerusalem, taking with them many of the scrolls from the temple, and formed an alternative “pure” community out in the desert, where they proceeded to make many more copies of the biblical texts. This parallels exactly what the New Testament describes about the corruption at that time of the office of the high priest and the religious leaders in Jerusalem. Other scrolls were taken from Jerusalem when the Romans attacked Jerusalem after the Jewish Uprising in 68 AD, and they took them with them as they fled to Masada near the Dead Sea, where they were able to successfully hide some of these scrolls. The long and short of it: We can trust the Bible. The Bible stands up to scrutiny, and the more scholarship and archeology discovers, the more the Bible is proven to be accurate and trustworthy. 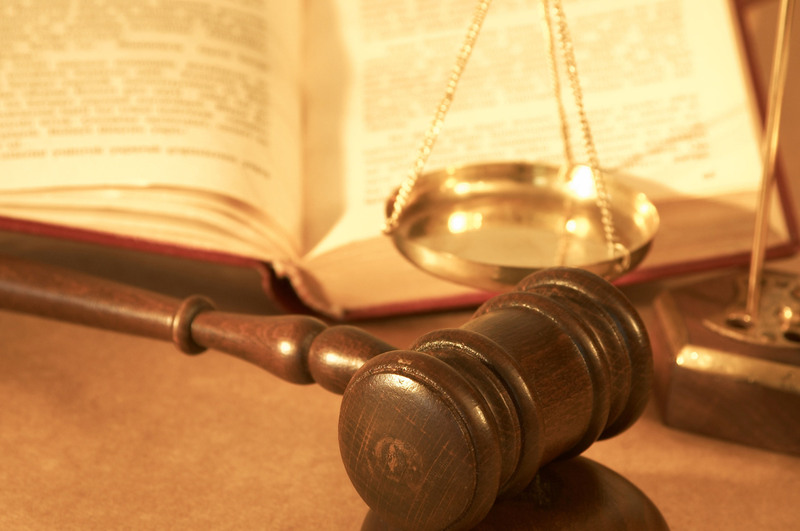 Do Christians Pick and Choose When It Comes to Old Testament Laws? One of the criticisms that is sometimes aimed at Christians, is that we “pick and choose” from the Old Testament laws, applying some of them to today, and not others. For example, we agree with the command “You shall not commit adultery”, but we seem to ignore other commands, such as the command not to eat pork and shellfish, or not to wear clothing made of fabrics made up of more than one material (i.e. that poly-cotton blend shirt). Why, someone might ask, do Christians say that the commandments about certain sexual behaviors are still applicable, but they don’t say the same about other commandments, such as executing people for breaking the Sabbath? Aren’t they just arbitrarily picking and choosing according to whatever they deem convenient for them? The answer is: because we must differentiate between the different types of laws in the Old Testament. To do so isn’t arbitrary at all, in fact it is the only faithful way of handling the Old Testament laws. Civil Laws, which governed the nation of Israel, dealing with behaviors and the punishments for crimes. Ceremonial Laws, about “clean” and “unclean” things, various sacrifices and other ritual practices. Moral laws, which declared what God deemed right and wrong, such as the 10 Commandments. For the people of Israel, all three types of laws blended together. Breaking a moral law had civil and ceremonial consequences. Breaking a civil or a ceremonial law was a moral problem. These laws went hand-in-hand because Israel was in a unique place historically, being both a nation and a worshiping community. God was their sovereign, their king, their ruler, not only over their worship, but over their entire civil society. They had no concept of “the separation of church and state.” Since that is the case for us today, our relationship to the Law is obviously different. This helps us to understand what often seems contradictory about the New Testament view of the Law. The New Testament says that Jesus came not to abolish the Law, but to fulfill the Law (Matthew 5:17) and because of what He did in his life, death and resurrection, we are released from the Law (Romans 7:1-6; Galatians 3:25). Understanding how Jesus is the fulfillment of the Law helps us see why we still look to some of the Old Testament laws to instruct and guide us, and “ignore” others. Things like not eating shellfish, for example, were incredibly thoughtful and merciful commands in the ancient world, for people who did not have refrigeration and did not understand microbes and bacteria. The same is true of pork. As they submitted to these laws without understanding why God had commanded them or what God’s purpose was with them, even if they might have seemed arbitrary to them at the time, the Jewish people benefited from them. There is certainly a lesson for us in that in regard to obeying God’s commands, even when we don’t understand why He has given them. The Ceremonial Laws illustrate God’s holiness and our unholiness and the inherent problem that we have in approaching God. As the book of Hebrews shows us, the sacrifices were fulfilled in Jesus’ perfect life and death. He is the final sacrifice, who cleanses us inwardly, not only outwardly, and makes us acceptable before God. The Moral Laws were fulfilled by Jesus in that He lived a perfect life, free of moral failure. Unlike the civil and ceremonial laws, which were bound to particular times and situations, the moral laws show God’s assessment of good and evil, right and wrong. They reflect God’s character, and since His character doesn’t change, neither do His views on morality. In fact, whenever Jesus talked about the moral laws, he either re-affirmed them or intensified them! (see Matthew 5:21-48). Thus the reason why Christians “pick and choose” from the Old Testament laws is not at all arbitrary, rather it is faithful to understanding the roles and purpose of the different laws, and it is faithful to the teaching of the New Testament. If the Bible says Jesus is the Son of God, how is it that Christians say that he is God? I answered this question on the air yesterday, but then got a follow-up question via email. Here are my responses; hopefully they will help others who have similar questions. The term Son of God is used in reference to Jesus many times in the New Testament. In John 20:31, John says: “these are written so that you may believe that Jesus is the Christ, the Son of God, and that by believing you may have life in his name.” If believing that Jesus is the Son of God is so important, it is essential that we understand what that means. Son of Man: This title is used 88 times in the New Testament, often by Jesus in reference to himself. It is a Messianic title which comes from the Old Testament book of Daniel: Daniel 7:13-14. By calling himself the “Son of Man,” Jesus is saying two things about himself: 1) He is the Messiah, 2) He is fully human. This is important, because there are those who are called monophysites, who believe that Jesus only had one (mono) nature (physis), i.e. that he was either fully human or fully deity, but not both. This position is held by the Coptic (Egyptian) church, but is generally considered heterodox. Son of God: Refers to Jesus’ authority and deity. Thus by saying that Jesus is the Son of Man and the Son of God, the Bible is teaching that Jesus was at the same time: fully human, the Messiah, and fully God. More on this below. God the Son: Refers to Jesus as the second person of the Trinity. For great resources on the Trinity and the deity of Christ, click here. Jesus is not the Son of God in the sense that he is God’s “offspring,” rather this term must be understood in light of how the term “Son of ______” was used in ancient, and specifically Hebrew, thinking/language. The word “son” was employed among the Semites to signify not only filiation, but other close connexion or intimate relationship. Thus, “a son of strength” was a hero, a warrior, “son of wickedness” a wicked man, “sons of pride” wild beasts, “son of possession” a possessor, “son of pledging” a hostage, “son of lightning” a swift bird, “son of death” one doomed to death, “son of a bow” an arrow, “son of Belial” a wicked man, “sons of prophets” disciples of prophets etc. The title “son of God” was applied in the Old Testament to persons having any special relationship with God. So, to be THE Son of God was a title reserved for the Messiah (or Christ in Greek). This is very clear from several verses which equate the term “Son of God” with the Christ/Messiah. However, when Jesus answers that question, affirming that he is the Son of God – he is accused of blasphemy and sentenced to death. Why would claiming to be the Son of God be considered blasphemy and worthy of a death sentence? It’s because the Jewish leaders understand exactly what the phrase “Son of God” meant: to be the Son of God meant to be of the same nature as God, in other words: to be God. That claim was considered blasphemy and according to Leviticus 24:15-16, a blasphemer was to be put to death. Jesus invoked the ancient and sacred name of God (I am) in speaking of himself. For this reason, the Jewish people tried to stone him on more than one occasion, for example: John 8:58-59 – Jesus said to them, “Truly, truly, I say to you, before Abraham was, I am.” So they picked up stones to throw at him, but Jesus hid himself and went out of the temple. So Son of God refers to Jesus nature and authority, not to his origin. The opening verses of the Gospel of John makes it clear that Jesus did not come into being when he was born as a baby in Bethlehem, but that he had existed from eternity past, as he is indeed God made manifest in human flesh. Does Isaiah 53:10 say that Jesus is God’s “offspring”? The question I got from another listener in response to this answer was asking if Isaiah 53:10 doesn’t actually refer to Jesus as the “offspring” of God. The answer is very simple: the “offspring” referred to here is the offspring not of “the Lord,” but of the “suffering servant” (the one whose soul is made an offering for guilt). What this is referring to is how, through Jesus’ death, many others would come to (spiritual) life. This is actually referenced to by Jesus in John 12:24, but in order to see this, we have to understand that the word translated into English as “offspring” is literally the word “seed”. Isaiah 53:10 therefore, is not referring to Jesus as God’s offspring, but referring to those who will come to new life as a result of Jesus’ sacrificial death. I hope this helps make sense of these things! Thanks for reading; if you have any comments or further questions, please write them below. For just as Jonah was three days and three nights in the belly of the great fish, so will the Son of Man be three days and three nights in the heart of the Earth. Here’s the problem: If Jesus died on Good Friday and rose on Easter Sunday, that doesn’t add up to 3 days and 3 nights. At most it adds up to 2.5 days and 2 nights. So… does that mean that Jesus didn’t stay in the grave long enough to fulfill his own prophecy? The Jewish calendar is lunar (based on the cycles of the moon), whereas the Roman calendar (which we use) is solar (based on the rotation of the Earth around the Sun). As a result, they don’t always correspond, hence the reason why the date of Easter changes every year. Today in Western Christianity, Easter is celebrated on the Sunday following the Paschal Full Moon. For more on why the date of Easter changes each year, click here. We tend to think of the new day beginning when we wake up, but in the Jewish mindset, the new day begins at sunset. So, when the sun sets on Monday, it is not considered Monday evening, it is considered the beginning of Tuesday. The word sabbath means “rest,” and it refers to a holy day when no work is to be done. Every Saturday is a sabbath, but there are other sabbaths as well – also known as “special Sabbaths.” Some of these “special Sabbaths” are celebrated on a specific calendar date, no matter what day of the week that date falls on – kind of like how we in the USA celebrate Independence Day on the 4th of July, and we observe that holiday no matter what day of the week it falls on. Now it was the day of Preparation, and the next day was to be a special Sabbath. Because the Jewish leaders did not want the bodies left on the crosses during the Sabbath, they asked Pilate to have the legs broken and the bodies taken down. The special Sabbath referred to here was the Feast of Unleavened Bread, a holiday which is always observed on the 15th day of Nisan according to the Jewish calendar. 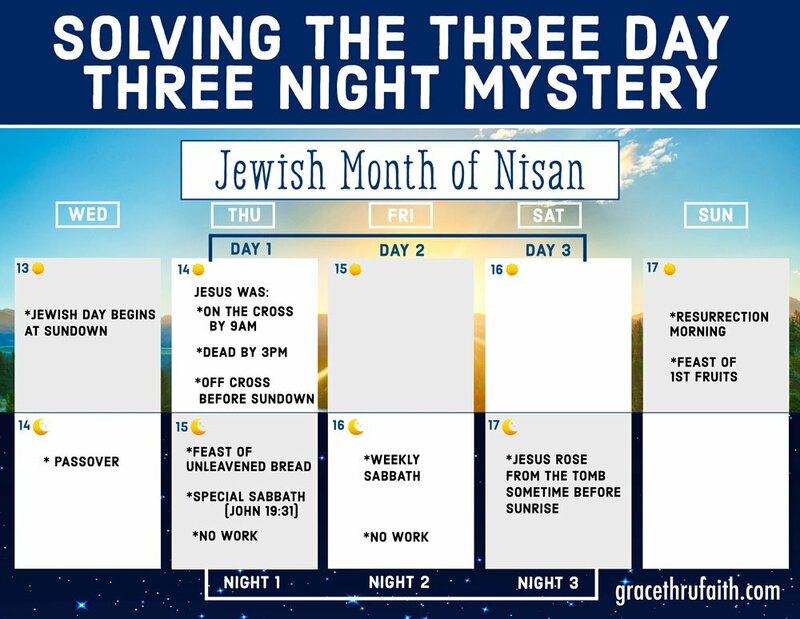 According to Leviticus 24:4-14, there are three special holidays in the month of Nisan: Passover (the 14th of Nisan), the Feast of Unleavened Bread (15-22 of Nisan) and the Feast of First Fruits which was held on the Sunday following the Passover. Jesus actually died on a Thursday. Friday and Saturday were both sabbaths: Friday was the first day of the Feast of Unleavened Bread, and Saturday was the weekly sabbath. How can we be sure that this is what happened? Several decades ago, the London Royal Observatory took on the challenge that since they could theoretically identify the position of the planets and start on any date in history, to figure out if around the time of Jesus there was such a time when Passover fell on a Thursday. Since the Jewish calendar is lunar, there is always a full moon on Passover, so this is pretty easy to figure out. Not surprisingly, there were several years around the time of Jesus when this took place. It’s really not that uncommon – just like how Christmas falls on a Tuesday every few years. According to Exodus 12:1-13, God told the Israelites that they were to select the Passover Lamb on the 10th day of Nisan. They were to examine it from the 11th to the 13th to make sure it was without blemish, and they were to sacrifice it on the 14th. If the 14th was Thursday – and Jesus was crucified on “the day of Preparation” (Matthew 27:62, Mark 15:42, Luke 23:54, John 19:31) which was the day when Passover began and the celebration began with the eating of the Passover meal (Jesus and his disciples then would have eaten the last supper Passover meal on Wednesday evening). Then what this means is that when Jesus entered Jerusalem on Palm Sunday, that was on the 10th of Nisan – the day when the Passover lambs were to be selected! But in fact Christ has been raised from the dead, the firstfruits of those who have fallen asleep. For as by a man came death, by a man has come also the resurrection of the dead. For as in Adam all die, so also in Christ shall all be made alive. But each in his own order: Christ the firstfruits, then at his coming those who belong to Christ. Jesus was indeed in the grave for three days and three nights. It really wasn’t that much of an anomaly, but it resulted in two sabbaths back to back – something which regularly happens every few years. So “Good Friday” was actually on Thursday, “Maundy Thursday” was actually on Wednesday, and “Holy Saturday” was actually two days long. Living abroad for many years, one of the things which I came to realize and be impressed with, is how much American citizens give to charitable causes. I was living in Hungary when the monster earthquake hit Haiti, and Hungarians were blown away to hear that average people in the United States were giving generously to help provide aid and relief for people they had never met in some faraway country. They were used to governments giving aid to regions with humanitarian crises, but for regular people to do such a thing was surprising to them. It could be because people in the United States have more expendable income than people in most parts of the world, and that our currency is strong and goes further than other currencies. But that doesn’t detract from the fact that there is a culture here in the United States of using what we have to do good for other people. Perhaps it comes from our history: having been a nation of immigrants, whose ancestors moved here to seek a better life or to escape poverty, and so it is built into our collective psyche, to use what we have to help others, knowing that we have experienced divine providential fortune to live in this country. It also can’t be ignored, that a great number of Americans identify as ‘religious’. Part of the Judeo-Christian ethic is that, like Abraham, if we have been blessed, it is so we might be a blessing to others – that God wants to bless other people through us (Genesis 12:2). The Sacramento Bee published an article last month, showing the Adjusted Gross Income of every county in the US compared to how much was given in that county to charitable causes, non-profits and churches. Interestingly, although perhaps not surprisingly, it was the poorer counties which gave more per capita than the richer ones. One of the major factors in how much people in a given county gave to charity seems to be religious affiliation; places with more people who attend religious services saw higher rates of charitable giving. The idea that people who have less tend to give more may not be surprising to everyone. Jesus drew the attention of his disciples to a woman in the temple who gave her last 2 mites – all that she had, whereas other people who had more gave less of what they had. Preachers have long cited statistics which show the same thing: ironically, the more one accrues, the more miserly they tend to become with it. How about Boulder County, Colorado, where yours truly is located? 2.6% of income was given to charity. That’s pretty low, and pretty ironic, because people in Boulder County, in my experience, talk a lot about being “locally minded and globally conscious” and caring about the well-being of other people, even if most of them are not Christian or attend religious services of any kind. Neighboring Weld County was not much better at 2.7%, Larimer County came in at 3.2% (there are quite a few more church-going folks up there). Do you give charitably? The Bible recommends 10% of one’s income. The only places that came close to that number were the heavily Mormon populated counties of Utah. Where do you direct your giving towards?